Burton Agnes Jazz and Blues Festival are delighted to announce their first artist confirmed for 2019 – King for a Day: The Nat King Cole Story. Featuring the world-class live music and vocals of Atila, this unique concert celebrates the centenary of the birth of one of the greatest vocalists and entertainers of the Twentieth Century: Nat King Cole. 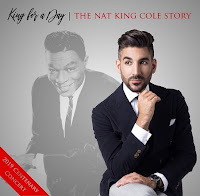 Featuring acclaimed vocalist Atila, alongside a world-class group of musicians, this thoughtful and entertaining new show takes a fresh look at the life and work of the timeless Nat King Cole, whose vocal styling in songs such as Nature Boy, Unforgettable and When I Fall in Love defined a golden era of music and earned him a place in the history of American music as one of the most iconic vocalists of all time. Following sell-out shows at London’s Hippodrome and Ronnie Scott’s, and featuring many of Nat King Cole’s most celebrated songs, alongside stylish reworkings of his lesser-known gems, this is a unique evening of music celebrating one of music’s all-time greats! 'He has a real feel for the lyric' - Sir Michael Parkinson. Dates have been announced for the thirteenth Burton Agnes Jazz & Blues Festival, set in one of the UK’s finest Elizabethan stately homes. Early bird tickets are now on sale. A wide variety of jazz, blues, acoustic, soul and funk – with, above all, superb musicianship – will grace the main stage, performance tents, courtyard and Great Hall. Firmly established in the festival calendar, this is a weekend designed for the whole family to relax and enjoy, in the most beautiful festival surroundings imaginable. The Burton Agnes Jazz & Blues Festival began in 2007 and past performers have included the multi-award-winning Claire Martin OBE and Ray Gelato, Mississippi native Lisa Mills, Belfast Blues legend Kaz Hawkins, 3 time Grammy nominee Billy Branch, Jo Harrop and the New York Brass Band, to name but a few. Buckingham Palace and Chatsworth House.